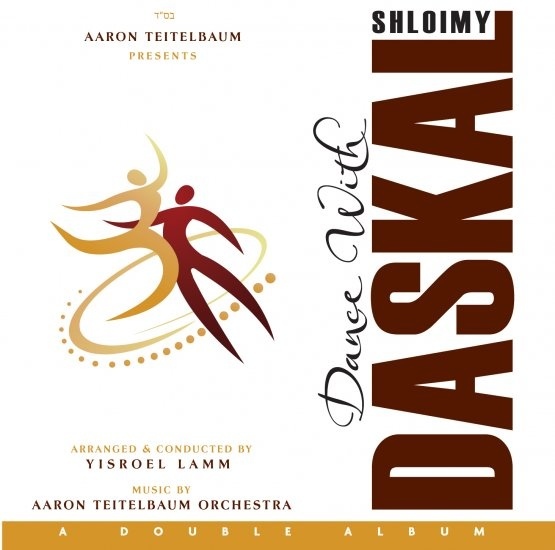 Just out: Dance with Shloimy Daskal, a double album produced by Aaron Teitelbaum, arranged and conducted by Yisroel Lamm with music by the Aaron Teitelbaum Orchestra. Dance with Daskal is offers the excitement of a wedding with the quality of studio sound, featuring top musicians, exciting new arrangements and varied musical styles, including chupahs, rock, freilach, disco, hora, dinner music and virtuoso pieces executed to perfection by Joe Deninzon. Stay tuned to future albums from this very talented team of musicians! It’s been 2 years since Shloimy Daskal has released/been featured on an album. Don’t take that to mean that he hasn’t been very busy. In fact he has been performing almost every night at weddings, simchas, dinners and events for tzeddakah. He is one of the most sought after Chassidic singers today. It came to a point though when Shloimy decided that after all the requests from Daskal fans, it was time to give them what they wanted. This DOUBLE ALBUM entitled “Dance with Shloimy Daskal” is NOT a wedding album. Aaron Teitelbaum explains that it’s a Simchas album. What does that mean? It means that whether you are looking for some music to pick you up, need some great dancing material for your group this Purim, or are having a party and need to set the mood, THIS is the album for you. This DOUBLE ALBUM features over 40 tracks with THE BEST of today and yesteryear. That’s right, I am talking about golden hits from Dedi, Yehuda Glantz, MBD and even some from Miami Boys Choir. Add some of today’s biggest from Shloime Gertner, Yoely Greenfeld, MBD and 8th Day. Not enough for you? Then how about some of the BIGGEST Chassidic hits from Slonim, Sklulen and more. This album is sure to make everyone’s collection. The album was masterfully arranged by the maestro himself, Yisroel Lamm, with music production by Aaron Teitelbaum featuring the Aaron Teitelbaum Orchestra. Shloime himself has never sounded better and he is joined by both the Meshorerim & Shira Choirs. The album is being distributed by Nigun Music and is available for purchase and download on their website TopJewishMusic.com. In honor of the release of this new album Shloimy Daskal & Nigun are giving away a track as a FREE download. That’s how confident they are that you will like the CD. This song is Mekimi originally done by Yeedle. Although it isn’t a dance song like the rest of the album, you can defiantly get the feel of Shloimy’s dynamic vocals and the Aaron Teitelbaum Orchestras amazing accompaniment. So head straight to TopJewishMusic.com to download your FREE track and enjoy the audio sampler below.